Rock Star Gary reflects on WWF Monday Night RAW 06-28-1993 – Scotts Blog of Doom! Kamala reversed a cross corner whip and clotheslined Michaels. While Vince shilled the Stars’n’Stripes Challenge this Sunday, Kamala slammed Michaels. He then gave Michaels a cross corner whip but ate knees on his follow-through. When Michaels mounted the second turnbuckle, he leaped right into a Kamala bear hug. Following a commercial break, Kamala still had the bear hug applied and earned a series of 2-counts. Michaels then missed a dropkick, so Kamala gave him another cross corner whip. Unfortunately for Kamala, he came up empty on his follow-through and injured his left knee. Michaels then delivered a knee crusher while Kamala wailed in agony. Shortly after, Kamala tossed Michaels over the top rope to the floor yet returned Michaels to the ring the hard way. As he hit a double thrust to Michaels’ throat, Kamala splashed Michaels’ back. True to form, he had performance problems trying to secure a pin. After Diesel got up on the apron, he distracted Kamala. That allowed Michaels to deliver a superkick to the back of Kamala’s head. Summary: Whether he’s a heel or face, Kamala doesn’t bring much to the table. At this point in Michaels’ career, he can’t quite carry a match with a big lug, and this match proves it. After the match, Kamala nails Michaels repeatedly until Diesel ambushes him from behind. Promo for the Stars’n’Stripes Challenge airs. Included is a short clip where Hulk Hogan couldn’t slam Yokozuna. Gee, ya think Hogan’s persona-non-grata these days in the WWF? In the ring, Vince interviews Mr. Fuji with Yokozuna. While the Poughkeepsie faithful chants “U-S-A,” Fuji wants the professional athletes who try to slam the WWF champion to humiliate themselves. Vince then informs Fuji that “someone always steps up to the plate.” Is he inferring that Mark McGwire could be the one to slam Yokozuna? Hmmmm… nevertheless, Fuji mockingly mourns the death of Hulkamania and notes that Yokozuna will be WWF champion FOREVER. To finish the segment, Yokozuna disparagingly compares American athletes to American products. 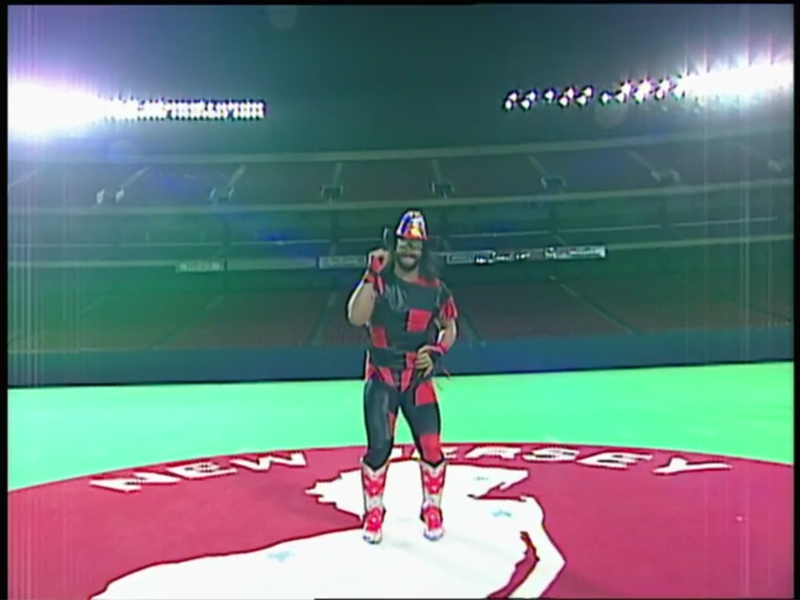 In a pre-recorded spot, New York Giants defensive end George Martin is ready to slam Yokozuna for the sake of America. Next, Green Bay Packers center Jim Campen will use his bear-catching experience to slam Yokozuna. Tatanka promises to slam the WWF champion. 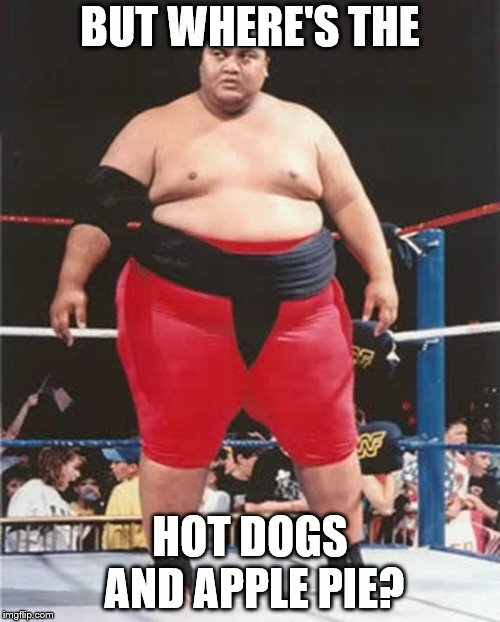 According to Vince, Chevrolet will give away a red, white, and blue pickup truck to whomever slams Yokozuna. After some heel miscommunication by Sharpe and Horowitz, Billy dropkicked Sharpe. Horowitz came in but received a hip toss followed by a dropkick. As Bart tagged in, he hooked an inside cradle on Sharpe for 2. Horowitz tagged in and gave Bart a knee lift. When Bart delivered a half-hearted cross body block, he got 2. Horowitz then reversed an Irish whip, leap-frogged Bart, and evaded him on another cross body block attempt. After Horowitz guillotined Bart with the bottom rope, he hooked a SWEET Northern Lights suplex for 2. Bart rebounded with a flying forearm upon ducking a double clothesline. As Billy tagged in, he slammed Horowitz and Sharpe consecutively. Bart tagged in, and the Gunns hit a Canadian backbreaker/elbow drop combo. Summary: Showcase match for the Gunns. We then revisit last week’s episode when the 1-2-3 Kid absconded $10,000 from Razor Ramon. In the ring, Vince interviews the FORMER WWF tag team champions—Money, Inc. DiBiase obnoxiously runs down Ramon about losing the money. While the Poughkeepsie faithful chants “Ra-zor,” DiBiase insults Ramon and the Steiners collectively. Savage then shills WWF Mania this Saturday at 10am ET. While Polo acted smug wearing a captain’s outfit, Walker attempted a sunset flip. 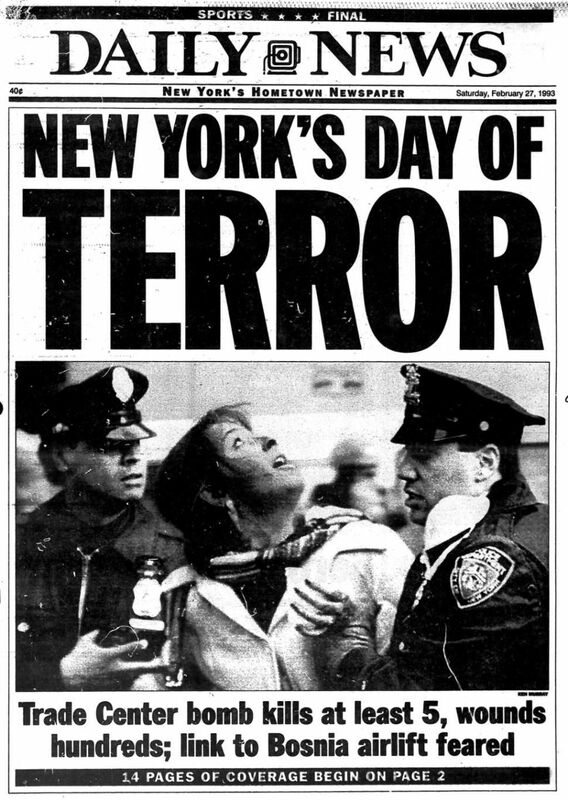 On the other hand, Bomb hoisted Walker up and tossed him like yesterday’s newspaper. He then gave Walker a sidewalk slam and hung him out to dry on the top rope. When he tossed Walker over the top rope to the floor, Bomb joined and gave Walker a short-arm clothesline. He then returned Walker back into the ring, mounted the apron, and delivered a springboard clothesline. To finish him off, Bomb hit an Atom Smasher (powerbomb). Summary: Showcase match for Bomb. Promo #2 for the Stars’n’Stripes Challenge airs. Crush attempted a fireman’s carry, but Booger’s volume was too thick. As Crush gave him some semblance of a back drop, he dropkicked Booger. With Booger on the floor, Crush joined and tried to ram him into the ring post. Instead, Booger made him HIT THE POLE, clotheslined Crush, and made him HIT THE POLE again. He then rammed Crush face-first into the steps before securing a bear hug in the ring. When Crush awkwardly delivered a vertical suplex, he slammed Booger not once, not twice, but thrice. Summary: Showcase match for Crush, but Booger’s no first-round pick in my book. We then head to Giants Stadium in East Rutherford, NJ where Savage interviews New York Giants running back Joe Morris. Promotional consideration paid for by the following: Slim Jim and WWF Royal Rumble: the video game. Conclusion: From the looks of it, the WWF made Crush look like the favorite to slam Yokozuna. I’d skip this episode and move on to the recap of the Stars’n’Stripes Challenge on next week’s show. By the way, where’s the Narcissist? Stay tuned for WWF Monday Night RAW 07-05-93!